Italian painter, called Mao. He supported Giovanni Baglione, his friend, biographer and artistic mentor, in his 1603 libel suit against Onorio Longhi, Caravaggio, Orazio Gentileschi and Filippo Trisegni. Much bad feeling existed: in his testimony Caravaggio contemptuously described Salini as Baglione s "guardian angel", dismissing his daubs and denying having ever seen any of his works. In his life of Salini, Baglione not only described several of the painter s public commissions, but also credited him as the first to paint and arrange flowers with leaves in vases. Those pictures that have been identified include his altarpiece dedicated to San Nicola da Tolentino in Sant Agostino, Rome, the main altarpiece from Sant Agnese in Agone in Piazza Navona showing St Agnes saved by an angel, and the standard for the Compagnia degli Scalpellini at Santi Quattro Coronati, Rome. Baglione reserved highest praise for Salini s subjects drawn from life. 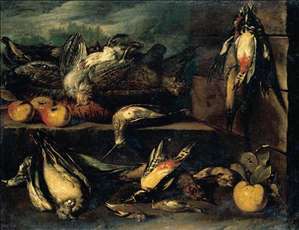 Though today their identification and chronology are problematic, in the seventeenth century his still-lifes were much in demand. 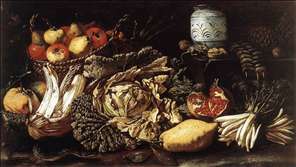 The inventory made at his death lists numerous paintings of flowers and fruits, twelve of which entered the Medici collection in 1620, for which Salini, of Florentine patronage, was rewarded with a medal on a gold chain. The Ludovisi owned 36 "vasi dei fiori" and a flower piece by Salini was listed in the 1627 Del Monte inventories. 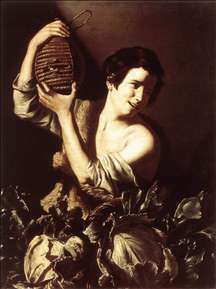 Genre pictures developing original motifs and unusual themes indebted to Caravaggio s early scenes have also been attributed to him. A member of the Accademia di San Luca from 1605, Salini was expelled but later readmitted. The donation in 1618 of his ecstasy of St Francis (Santi Luca e Martino, Rome) commemorated his reentry, though his hostility towards Antiveduto Gramatica led to further disputes. Cited as Cavaliere in a census of 1623, Salini was awarded the order of Lo Speron d Oro. See more details about "Still-life with Fruit, Vegetables and Animals"
See more details about "Boy with a Flask and Cabbages"